This entry was posted in Animals, Silliness. Bookmark the permalink. 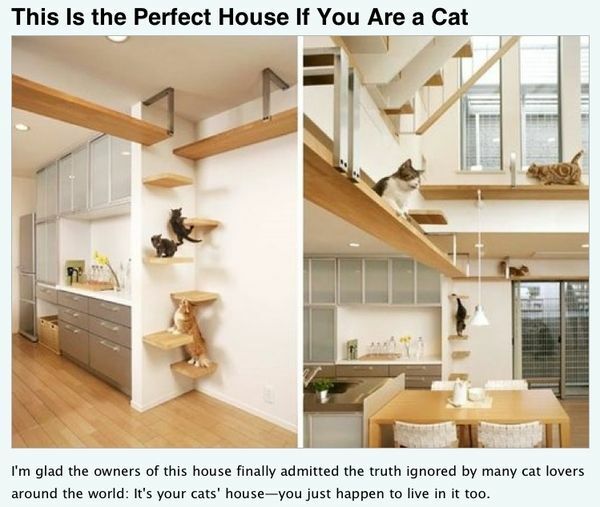 0 Responses to Cat house. It would be so entertaining to watch them too. Does any human actually live there? SO TIDY. SO UNLIKE ANY HOUSE I KNOW… but way cool cat set-up! This kind of reminds me of the Winchester Mystery House in San Jose. The widow built a bunch of staircases that went nowhere. People said she was crazy but maybe she just had a bunch of cats!